I love bread. It’s one of my favourite foods. Plenty of other people have written about bread, so I’m not bothering with an essay on the subject of bread here. Because I love to eat it, I have to make it, which I have been doing for a long time. Simple white loaves, multi grain bread, rolls, focaccia, and of late, a lot of pizzas. I have always wanted to master sourdough, that amazing bread that comes from flour and water, where you create your very own yeast. 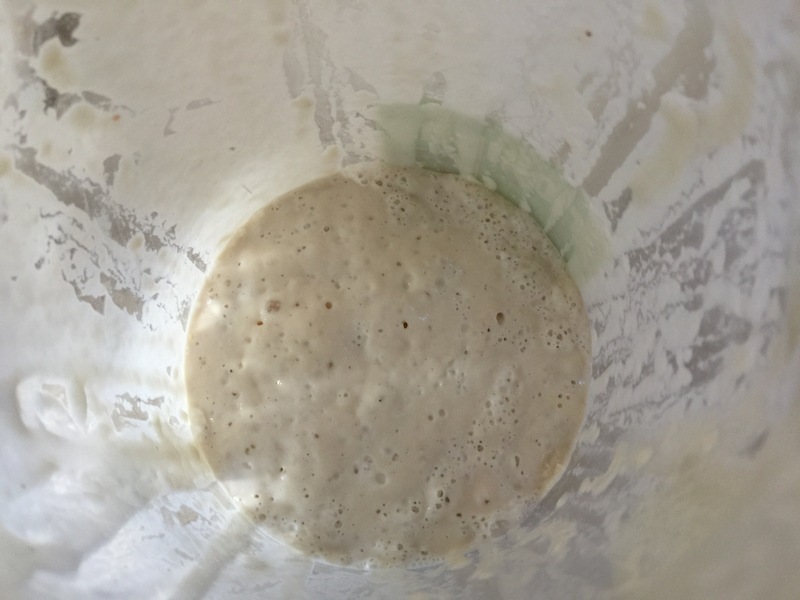 Getting a sourdough starter going is one thing, getting the starter to rise decent bread is another. Up until now, I’ve had some really disappointing loaves. But then I found that excellent baker of all things yeasty James Morton. James was a finalist in the Great British Bakeoff 2012 series. A Scotsman with a taste for fair isle vests, he impressed me with his traditional recipes and no-nonsense approach to baking. So – I bought James’ first book Brilliant Bread and I have not looked back. A great, all round common sense book on bread making, and the source of the illusive recipes for a successful sourdough starter and sourdough loaf made with the starter. Preheat the oven to 240 degrees C at least 30 minutes before you intend to bake, and heat your a cast iron casserole pot with the lid on. When the 30 minutes is up, it’s time to turn out the proved dough into the pot. Turn down the oven to 210 degrees C. Take the lid off the pot and carefully turn out the dough into the pot. The smooth side will be on top. and score a cross on your loaf with a sharp serrated knife. 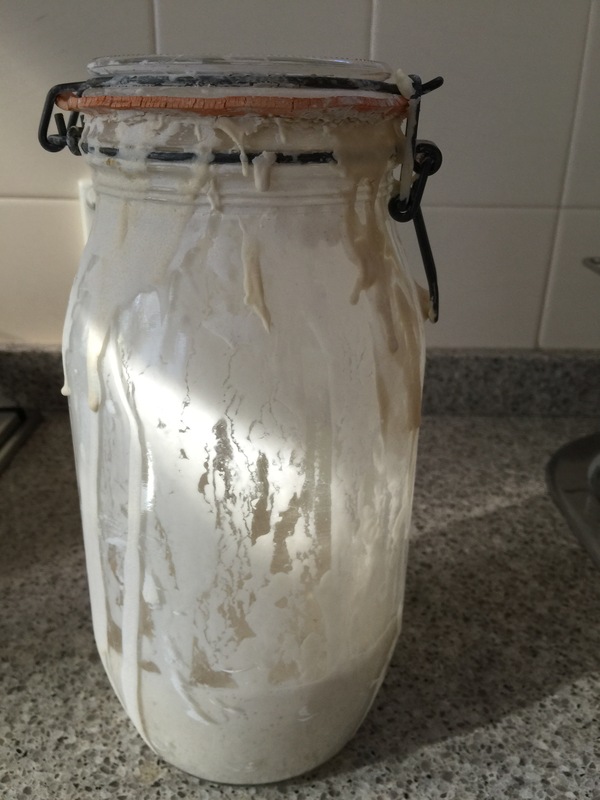 Posted in Bread and tagged Brilliant Bread, James Morton, sourdough starter, strong flour, yeast. Bookmark the permalink. The recipe that follows is based on one from Gourmet Traveller and omits the soda water and uses more milk. The results were similar although I think the soda water version was a little lighter. Heat milk and butter over a low heat until butter melts, then stand until lukewarm.Combine sugar and yeast in a small bowl, add 100ml milk mixture, stir to dissolve then stand in a warm place until foamy (4-5 minutes). Combine flour and a pinch of salt in a large bowl, make a well in the centre and add yeast mixture, stirring to incorporate a little flour. Add remaining milk mixture, stir until smooth and combined, cover and stand in a warm place until very foamy (1-1½ hours). Dissolve bicarbonate of soda in 25 mls warm water, add to batter, beat to combine. Cover and stand until bubbling (25-30 minutes). Heat a frying pan over low-medium heat. 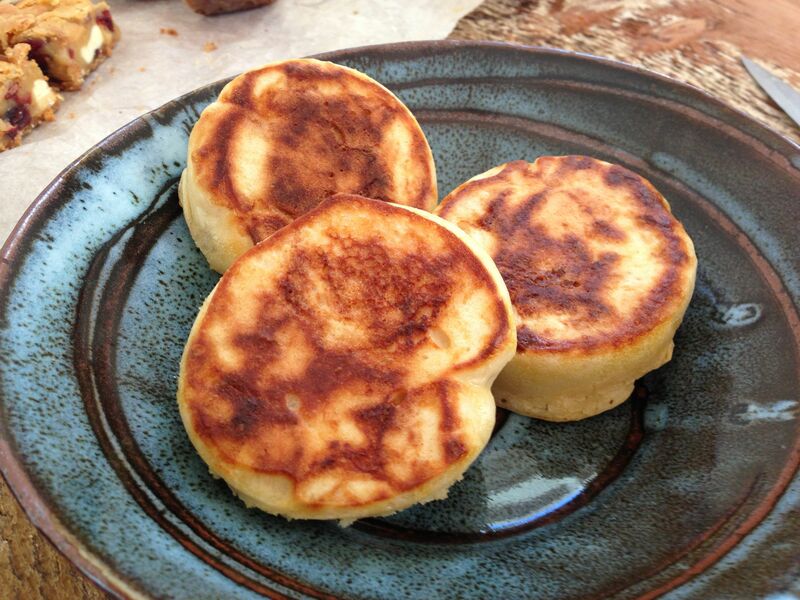 Add a little butter, then place buttered crumpet rings in the frying pan and fill each two-thirds full with batter. Cook until mixture bubbles and small holes form on the surface (4-5 minutes). 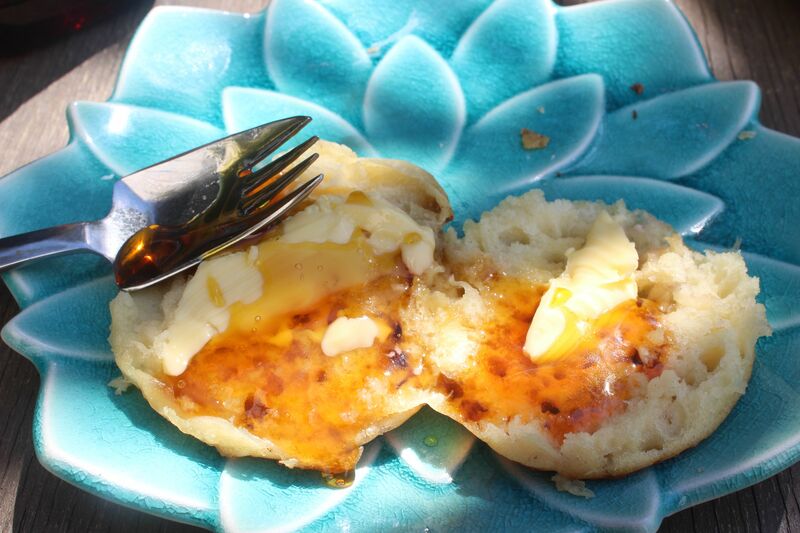 Remove rings, turn crumpets and cook until light golden (1 minute). Serve warm immediately or serve toasted the following day. 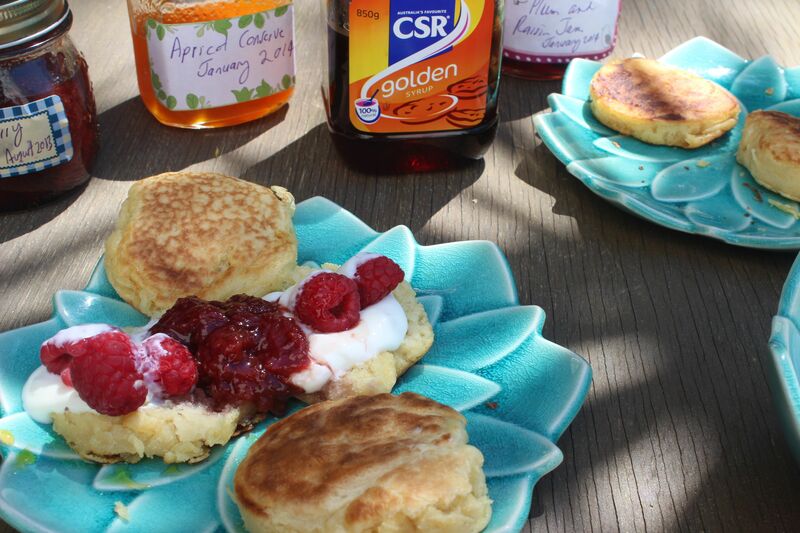 I ate them with butter and jam and I also tried golden syrup and fresh berries and yoghurt. This quantity makes about 10 crumpets. 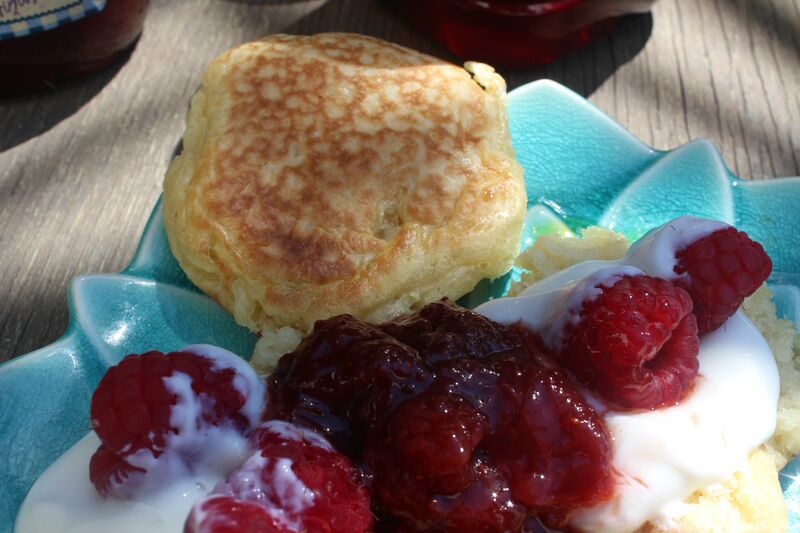 Posted in Breakfast, Jams, Marmalades, Conserves and Chutneys, Pancakes, Crumpets and Waffles, Sweet Food and tagged bicarbonate of soda, butter, golden syrup, soda water, strawberry jam, yeast, yoghurt. Bookmark the permalink. 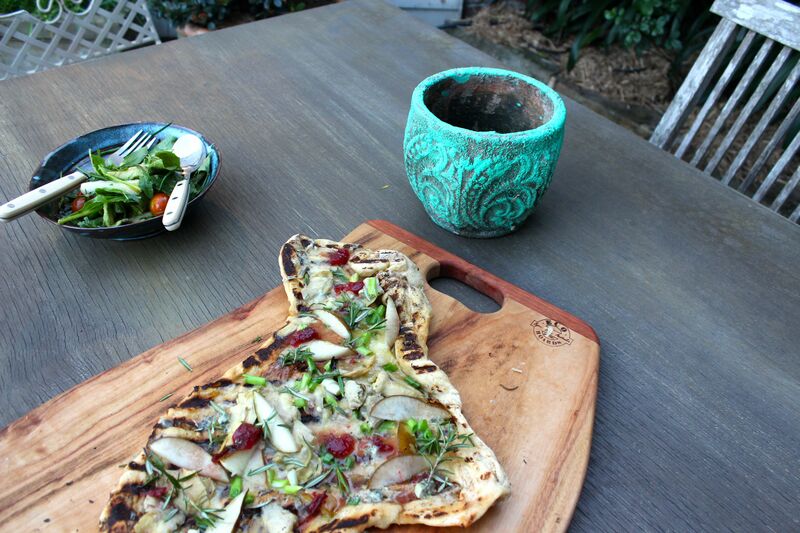 Making pizza on the barbecue is really easy as I discovered when I made one for the first time. I make lots of pizzas – home made is always nicest – but I was delighted with how quick and easy grilling the dough on the barbecue is! 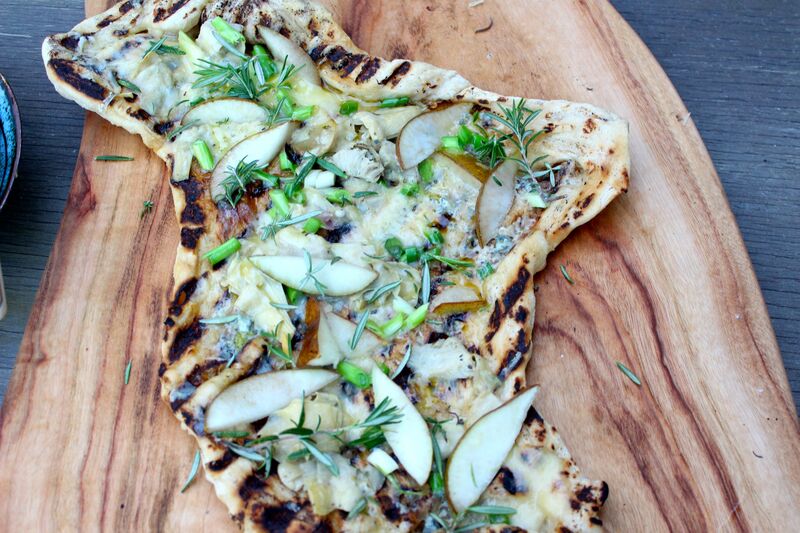 You make a normal pizza yeast dough – then grill it for a minute each side on the bars of a very hot barbecue. Then dress the grilled pizza with your toppings of choice, place on a baking tray and heat on the barbecue on medium heat, with the hood down to simulate an oven. Fresh, hot, grilled pizza made right in front of your friends! You could even do “make your toppings” with everyone customizing their own pizza! Dissolve the yeast in the warm water in a large bowl and let stand for 5 minutes. Stir in most of the flour and the salt, stirring until smooth. Continue adding the flour, 1 tablespoon at a time, stirring until the dough comes away from the bowl but is still sticky. Turn the dough out onto a lightly floured work surface and knead with lightly floured hands. Knead the dough until it is smooth, elastic and soft, but a little sticky, about 10 minutes. Shape the dough into a ball and transfer to bowl lightly oiled with extra virgin olive oil, turn to coat. Cover with cling wrap and let rise in a warm place until it doubles in volume, about 2-3 hours. Press it with your finger to see if it’s done; an indent should remain. Remove the dough from the bowl, divide in half and shape each half into a ball. This quantity makes 2 small pizzas. Or leave as 1 ball for 1 large pizza. Brush with more oil and set aside for 30 minutes. Heat your barbecue to very high. Stretch and shape the ball/s of dough into a rectangle or round – or any rustic shape! Brush the top/s with oil and sprinkle with salt and pepper. Let rest for 15 minutes. Place on the grill directly on the bars, oiled side down, and grill until lightly golden brown, about 1 minute. Flip over and grill for 1 minute longer. 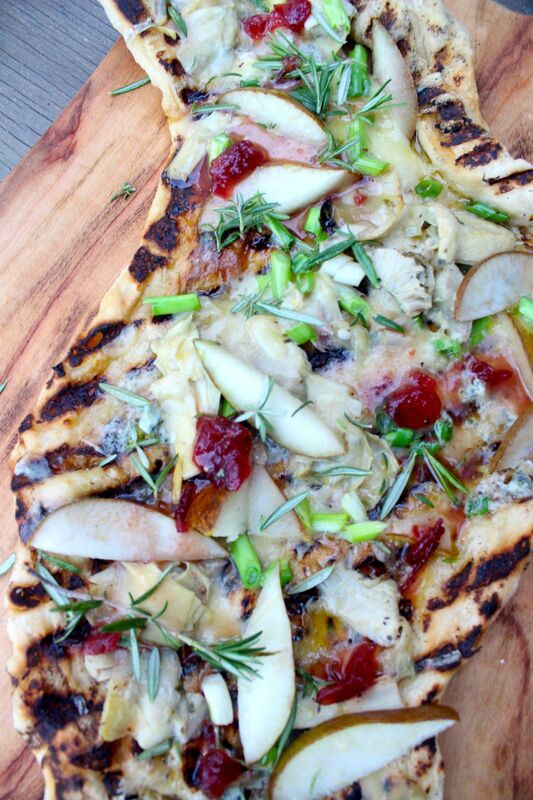 Scatter over cheddar cheese, spring onions, sliced pear, sliced artichoke hearts and crumbled blue cheese. Return to the barbecue, turn down the heat to medium, close the cover and cook until the cheese has melted and the pears are heated through, about 5 minutes. Remove from the barbecue and drizzle with the rosé and cranberry dressing and garnish with rosemary sprigs. Cut and serve immediately. Combine ¼ glass of rosé with a splash of caramelized balsamic, 2 tbs extra virgin olive oil, 2 tsp of cranberry sauce and sea salt and black pepper to taste. You can vary these proportions to achieve the desired taste. Posted in Pizza, Savoury Food and tagged artiichoke hearts, barbecue, blue cheese, caramelized balsamic, cranberry, pear, pizza, rosé, rosemary, spring onions, yeast. Bookmark the permalink. 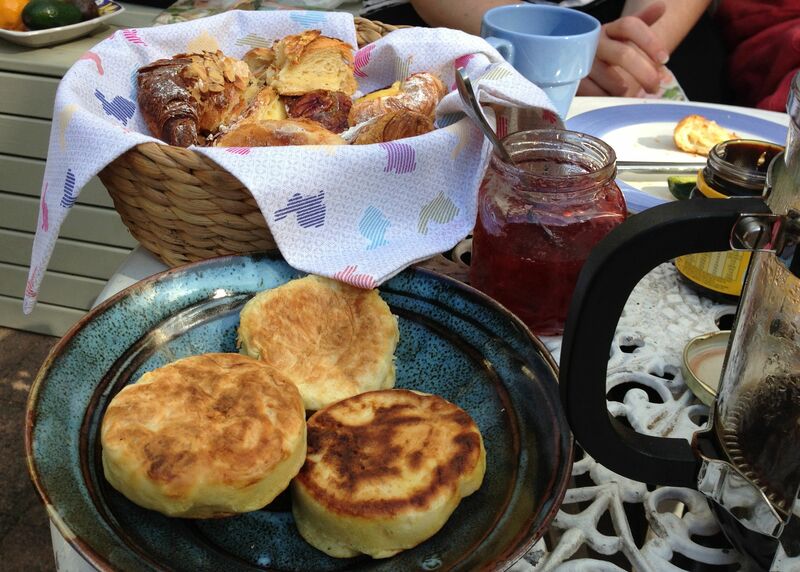 Butter, honey or jam to serve. Sift the flour, caster sugar and yeast into a large bowl. Stir in the milk, then add the soda water and whisk until smooth. Cover the bowl with plastic wrap and allow to rest for about 1-1/2 hours, or until doubled in volume. Beat in the bicarb and salt. Heat a heavy-bottomed frying pan or the griddle plate on your barbecue until medium-hot. 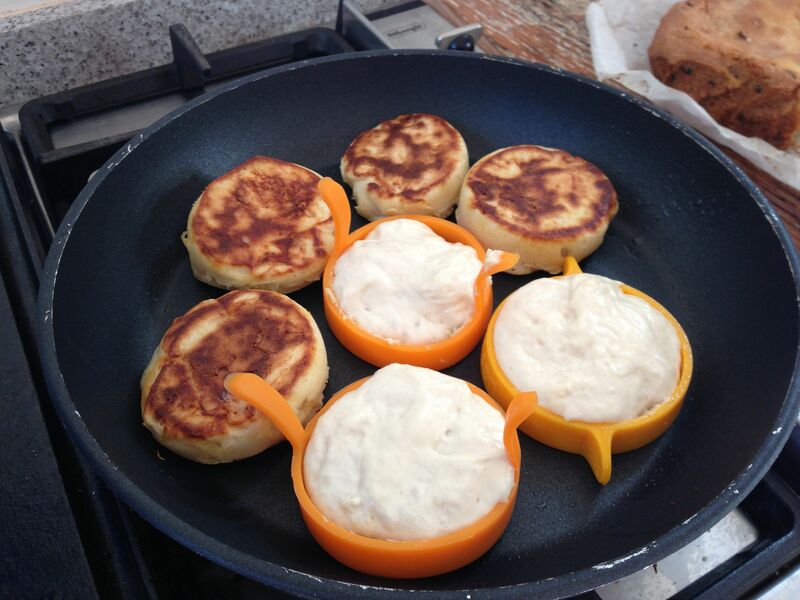 Oil or spray the inside of the crumpet rings, as well as the pan or barbecue plate. Place the rings on the cooking surface, making sure they’re evenly flat. Spoon 3-3 1/2 teaspoons of batter into each ring and gently cook for 6-7 minutes, or until the batter is set and covered with little holes. 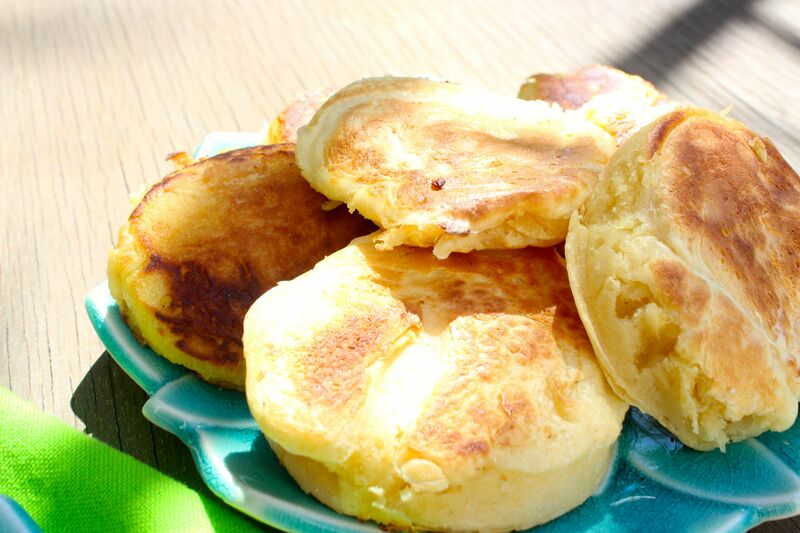 Turn the crumpets over and cook for another 2 minutes. The bottom should be golden brown and the top only slightly coloured. 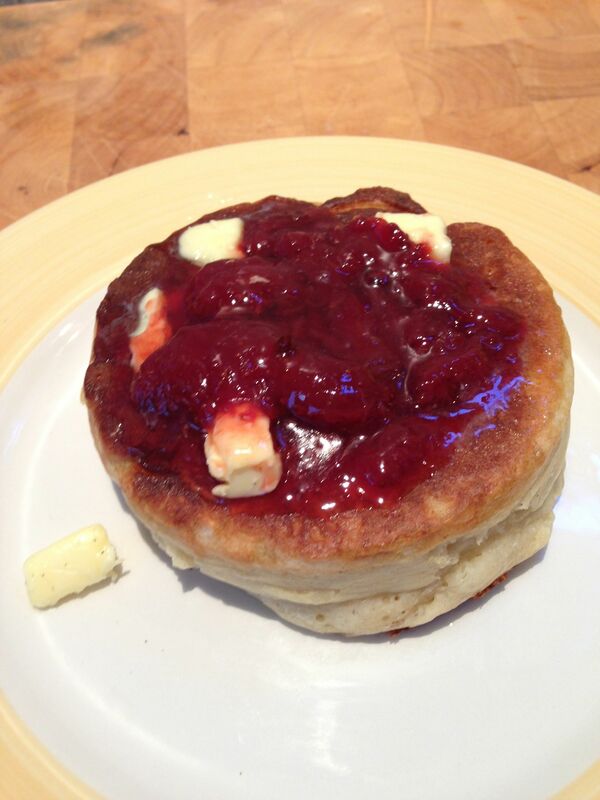 Posted in Breakfast, Jams, Marmalades, Conserves and Chutneys, Pancakes, Crumpets and Waffles, Sweet Food and tagged breakfast, brunch, crumpets, easy, home made, strawberry, yeast. Bookmark the permalink.